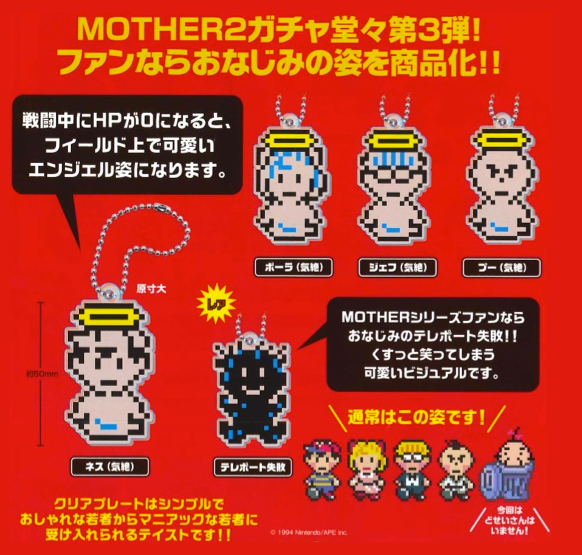 Although I need a bunch of keychains like I need a hole in the head, I'm seriously considering pre-ordering the "Mother 2 Kizetsu Plate" set shown below. After all, these aren't your typical EarthBound/Mother 2 keychains; rather, they feature the game's four main characters--Ness, Paula, Poo and Jeff--in their "unconscious" states, halo-topped noggins and all. For me, though, the standout of this set is the "teleport failure" keychain. That's the one I'd be sporting if I were to pick up these Takara Tomy Arts-made gashapon figures. Thankfully, I've got a bit of time before I have to make up my mind one way or another, as it appears they won't be made available until February of next year. Should any of you already know you want them, though, you can pre-order a complete set (for $22.90) via shopncsx.com. I especially like how it was impossible to guess someone would make keyrings out of ghost Earthbound characters. It's pretty genius. I'm also a huge fan of the teleport failure keyring. Gotta love the humour in Earthbound. It is pretty genius, isn't it? And now I'm surprised it took someone so long to come up with such a product. I wonder what other surprising, EarthBound-related products could be in store for us? Yeah, she is a lovely character, isn't she? And now I want to play through this game again. Maybe around Christmas?